If anyone had told me a year ago that I’d be leaving Manhattan to move back home to Bliss, Texas, I’d have told them they were plum crazy. But here I am, Buttons & Bows isn’t exactly thriving, but it’s holding on thanks to the Sandoval-Kincaid wedding and my personal benefactor, Mrs. Zinnia James, wife to Senator Jeb James. I’ve learned some things since I’ve been back. Meemaw passed (which is how I came by the old yellow farmhouse off the square), but her, er, spirit, is right here in the house... and boy, oh boy, does she cause a mite of trouble every now and again. Even from beyond the grave, she’s getting what she wanted, which is the way it should be, I reckon, since that is her Cassidy charm. I’d thought I’d leave crime and drama behind when I came back home. Not so. Murder, gossip, and secrets prevail in Bliss... maybe even more than in the city. I love being back home in Bliss more than I ever thought I would. Not only did Meemaw get what she wanted, she helped me get what I want. Now I have to figure out new ways to bring people into Buttons & Bows (Bliss is not a mecca of fashion, after all). After the wedding, I’m contracted to make a summer garden dress for Mrs. James, work the Margaret Moffette Lea Pageant and Ball (that’s a Bliss institution, if there ever was one and I'll tell you all about it come February in A Fitting End! ), and I have a few miscellaneous jobs. I’ll be making a few off-the-rack dresses. But what next? Mrs. James has mentioned a winter fashion show. And I’ve been tossing around the idea of offering sewing or doll making classes. Wish I could get some input, journal. 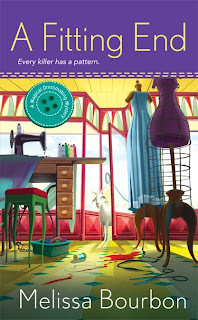 Beginning sewing classes? Doll making? Maybe a Santa doll! That would ring in the holidays for me, and maybe get my mind off the murder I got wrapped up in. 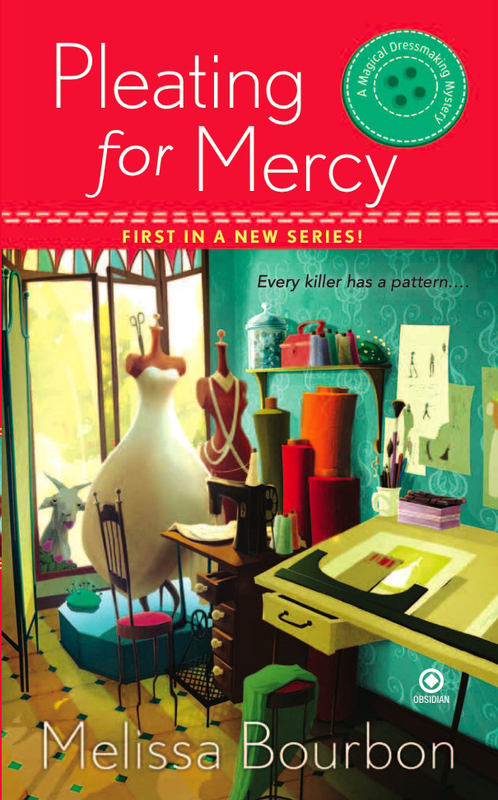 Order Pleating for Mercy Now! "A fun read, and the historical tie-in with Butch Cassidy was a kick. 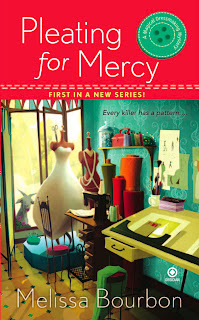 Harlow's character [is] compelling and relatable as a down-to-earth designer and seamstress." Harlow Jane, I can hardly wait to read about your adventures. And I'm curious about that curious goat. Thelma Louise is the fiestiest goat you'll ever meet! I think the doll-making class would be fun. Can't wait to read about your adventures in Bliss. All ideas sound good, Harlow! Just how much time is this murder taking up? Doll making class would be great. So many different types of doll to be made. If it wasn't so darn hot there this week, I think I'd move to your town too - sounds like a great place for creativity and crafts and the odd pesky murder. Regular doll making, or santa dolls, Dru? Erika, investigating a murder takes up WAY too much of my dressmaking time. It's a wonder I can get a bridesmaid dress made at all. It IS hot in Texas, Mary Jane. And no swimming pool at the old farmhouse. Oh, Nancy, maybe you'll sign up? I forgot to answer the doll question. Santa's outfits might not be as much fun as outfits for other dolls, so I'd probably prefer the regular doll-making class. Will sign up soon . . .
Hmmm, I'll have to post some pics of my Santa Art Dolls next time I'm around KC. They are GORGEOUS. You might change your mind, Janet!